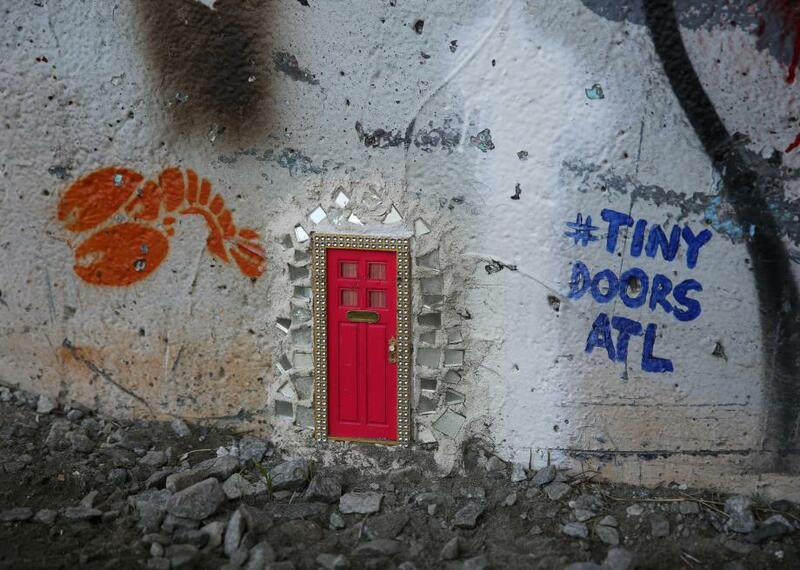 #TinyDoorsATL: Scattered around Atlanta are tiny little doors with great big charm. Atlanta’s Beltline Trail is a 2-mile Eastside trail that’s home to large-scale graffiti murals and some amazing wide-open views of the city. It’s also home to Tiny Doors Nos. 6 and 2, and like all the Tiny Doors, they are small enough to be easily overlooked. Not all doors need to be opened to lead you somewhere interesting. Installed in unexpected places around Atlanta are nine (so far) whimsical vignettes featuring 6-inch miniature doors. And the story behind each door is yours to imagine. The #TinyDoorsATL project was started by Atlanta artist Karen Anderson with the stated goal of inspiring curiosity and exploration in people who happen across the little doors, which are affixed near various landmarks that make Atlanta unique. Hidden in plain sight around the city, the doors are meant to draw your curiosity down to ground level and be seen by those who take the time to look. Sometimes the best ideas come along in one-twelth scale. Submitted by Atlas Obscura contributor Toriz. For more on Tiny Doors ATL, visit Atlas Obscura! Europe’s largest community of crocodiles and alligators. The iconic giant foot from Monty Python’s Flying Circus was borrowed from this classical painting. Teddy Roosevelt’s famous “midnight ride to the presidency” started at this small lake high up in the Adirondacks.